XTU is closed since 4 November 2017. Use 1,2,4,6,8,10,12,14,16,18 processor core(s) in total. wickpote's 3d mark 01 score does not appear to have used default settings as the rules dictate. From my testing you can gain over 10000 from running non defaults. Screenshot fails anyhow. Don't worry, it will be blocked. In what was does the screenshot fail? I am just wondering so I can make sure mine is correct. oh, ok sorry my bad, i'll do another screenshot soon, and do u know which test do we have to do ? all tests, or only game tests? Only the 7 game tests. The other tests don't actually affect your score. You don't have to run them all at once, for example once you have a score you can rerun just Nature for basically as long as you can be arsed with in the hopes of getting a better score out of it and a higher overall score as a result. 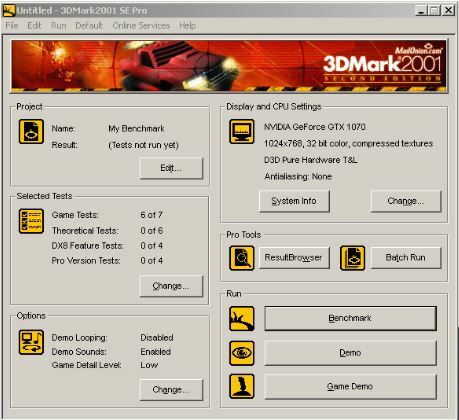 That's what's going on with scores like scannick`s 3DMark2001 SE score: 156998 marks with a Radeon HD 4870 where you can see only 1 game test is selected.